President-elect Jean-Claude Juncker secured confirmation for his new Commission from MEPs today (22 October), winning over a grand coalition of Socialists and centre-right MEPs, using a combination of charm and a few last-minute tweaks to policy. Parliament’s largest three groups, the European People’s Party (EPP), the Socialists & Democrats and the Alliance of Liberals and Democrats for Europe (ALDE) broadly voted, with 423 in favour, to support the proposed new 28-strong executive. 209 MEPs voted against, and 67 abstained, primarily, reports indicate, from the conservative ECR group. The Greens, the European United Left and Europe of Freedom and Direct Democracy groups all rejected the new team, whilst the Conservatives and Reformists abstained. Spanish Socialists are said to have voted against Juncker, as their leader Pedro Sánchez had recently announced. Guy Verhofstadt, leader of the liberal ALDE group, said his force had decided to vote in favour of the “pro-European coalition” after lengthy discussions held late yesterday. One of the reasons, he said, hitting at outgoing President José Manuel Barroso, is that he expected the new Commission to no longer be “a secretariat to the Council”, where EU heads of state and government sit. Speaking to MEPs ahead of the vote, Juncker warned that his Commission represented the “last chance” to win back citizens’ trust. “Either we succeed in bringing European citizens closer to Europe, or we fail,” he told MEPs. “Either we manage […] to dramatically reduce unemployment, or we fail. Either we give a perspective to young Europeans, or we fail,” Juncker said in a debate that saw him deploy humour to placate both the right and left. Juncker called himself “the big loser” in the restructured Commission, because “I have delegated most of my jobs and prerogatives to the Vice-Presidents.” Juncker joked that he retained the power to take those responsibilities back, however. “I will not demand blind obedience from my Commissioners. I am too old to launch a new career as a dictator,” Juncker said, adding that the new Commission would be “more political” than the current one. Timmermans, the Dutch Vice-President for Better Regulation, Inter-Institutional Relations, the Rule of Law , and Charter of Fundamental Rights, emerged a star, following his hearing. Juncker insisted that EU’s budget rules will not be weakened against a backdrop of demands by France and Italy for more flexibility in required budget consolidation, against efforts by Germany to maintain more discipline. “The rules will not be changed,” Juncker said of the budgetary requirements, “but they can be implemented with a degree of flexibility”. The announcement came against a background of tension, as the EU executive prepares a review of the rules by the middle of December. The Luxembourgish President-designate announced some strategic tweaks to his proposed Commission, in order to clear the way for a broad coalition of support. He told Parliament that responsibility for pharmaceuticals – initially assigned to the commissioner-designate for industry, El?bieta Bie?kowska – would be put back into the charge of the Commissioner-designate for Health, Vytenis Andriukaitis. Socialists were unhappy with the industry commissioner controlling the pharmaceuticals portfolio. Hungary‘s nominee, Tibor Navracsics, will no longer handle the citizenship portfolio, Juncker said, responding to MEPs criticisms about Navracsics’ ties to the Hungarian government, which has clashed with the EU on civil rights issues. The portfolio will instead go to the new home affairs commissioner, Dimitris Avramopoulos of Greece. Navracsics was initially assigned Education, Culture, Youth and Citizenship, and will retain Education, Culture and Youth. Juncker also promised that a highly anticipated €300 billion investment programme aimed at boosting growth and jobs in the EU will be presented before the end of the year. It is unclear at present how the scheme will be financed. Jean-Claude Juncker defended the division of economic and social responsibilities between Commissioners and Vice-Presidents, saying “there is a Vice-President for the Euro and Social Dialogue, a Commissioner for Economic Affairs and another for Social Affairs. The Vice-President will of course have to coordinate the initiatives of the two Commissioners, because the European Semester is about more than just the economy”. “I would like to see you intervene immediately in the case of a deadlock between these Commissioners,” warned Guy Verhofstadt, president of the liberal ALDE group. He added that this would be unacceptable if the Commission was to make progress. The conservative, Eurosceptic ECR group welcomed the new Commission structure, despite abstaining from the vote. Syed Kamall, President of the ECR group, praised Juncker for coming up “with an integrated structure focused on outcomes,” and said the ECR was “particularly impressed” with the nomination of Vice-President Frans Timmermans. The new Commission will start working on 1 November, using the time available to assume the dossiers of the outgoing members of the college. “We need to quickly transform the Union from one that is involved in piecemeal crisis management into one leading a coordinated policy approach leading to stability, growth and unity for its citizens and Member States. In the last elections we had the courage to dare more democracy at European level. Now it is time to dare more politics," Schulz concluded. The European Conservatives and Reformists (ECR) Group abstained in today's vote on the new European Commission. The ECR Chairman Syed Kamall said while his political group agrees on the new structure and on a number of political priorities like cutting red tape and completing the single digital market, they disagree on the appointment of a few Commissioners. In particular, ECR was disappointed by not appointing a budgetary control Commissioner, or that “a French Socialist with a poor record on growth and stability pact” got an economic portfolio. "Where you pursue reform we will work with you. There is much work to do and we wish you well", Kamall concluded. The liberal ALDE group first Vice President Sophie in 't Veld told Juncker: "You have our vote today, but it is not a blank cheque for the next five years. We will support any proposal taking Europe forward, making it stronger, more democratic and better equipped to confront the huge challenges of today. ALDE expects fundamental reforms in the EU. We need a pro-European majority to move Europe forward. Within the majority, ALDE is the force for change, the Große Koalition stands for status quo and stagnation." The Greens/EFA co-president Philippe Lamberts and his group voted against the Juncker Commission because they are not convinced the overall package and policy direction is enough to re-establish the trust of citizens in the nascent European democracy. "The final College is clearly the result of a deal between the EPP, socialist and liberal groups in the EP. Rather than being chosen for competence, candidates have in many cases gotten portfolios based on party affiliation, with MEPs from the bigger groups accepting these problematic candidates as a quid pro quo. The male-heavy line-up and the unacceptably low representation of women in the College, is also a major source of regret." "This is not a blanket rejection: our group is supportive of many of the commissioners-designate and, as a pro-European political force, will work constructively with the new Commission where possible to try and ensure it delivers meaningful responses to the real challenges facing Europe and its citizens. "While president Juncker could only choose from the pool of candidates provided by the member states, we believe his choice of portfolio allocation has placed candidates in charge of portfolios in which they will have clear conflicts of interest, like in the case of Mr Canete and Mr Hill, or for which they are unsuitable, like Mr Navracsics. There were finally too many problematic areas for our group to endorse the team proposed by president Juncker." "Too many members of the new Commission provoke downright doubt that they will work to turn things around by stopping devastating austerity measures and prioritising social and ecological needs so that citizens feel that the EU is doing something positive for them. No one even admitted that the austerity policy of recent years with the privatisation of public goods and services, the reduction of minimum wages and pensions, attacks on individual and collective human rights were damaging. No one called for an end to this policy which has destroyed the social fabric of member states." Also commenting on the vote, GUE/NGL Vice-President Neoklis Sylikiotis said: "The EU must change direction with policies that create new jobs and ensure the welfare state. The solution against the crisis is found in policies that will boost the economy and social development, rather than on austerity policies. We cannot and will not stay idle if these policies continue. This is why we voted against the new Commissioners and the neoliberal policies which they express and represent." Corporate Europe Observatory (CEO) today criticised the Parliament’s vote in a statement today. It says: "The new Commission includes an ex-petroleum company president as climate commissioner (Miguel Arias Cañete); an ex-corporate lobbyist in charge of financial services (Jonathan Hill); a former vice-president of the industry lobby group Le Cercle de l'Industrie in charge of economic policy (Pierre Moscovici); an ex-Goldman Sachs financier as research commissioner (Carlos Moedas); and the former political no.2 to a Czech multi-billionaire as consumer commissioner (Vera Jourova)." 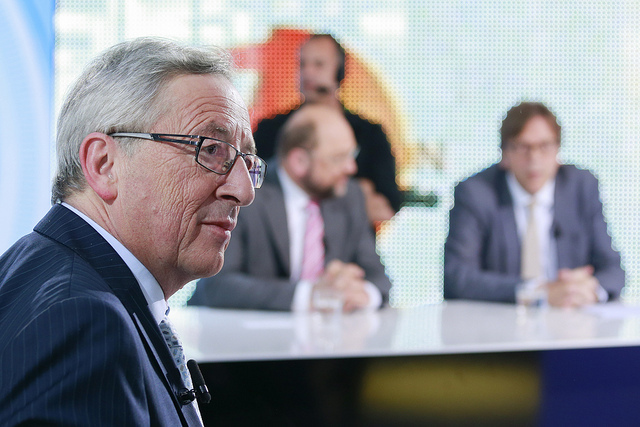 “It’s a positive sign that President Juncker has formed his team without further delay. His team received a strong vote of support from the European Parliament. Now we urge Mr Juncker and his colleagues to start their work immediately, as time is of essence. Not a minute more can be lost to strengthen our suffering economies. BUSINESSEUROPE will therefore present a comprehensive 10-point plan with its expectations to the new European Commission next week”. The Committee of the Regions (CoR) President, Michel Lebrun, has welcomed the new College of European Commissioners and its commitment expressed over the past few months to ensure a greater involvement of local and regional authorities in the European decision-making process. Referring to President Juncker's political programme for the next five years, President Lebrun said, “The Committee of the Regions will take these priorities as guidelines for its upcoming term-of-office and will closely monitor its implementation, especially with regards to EU Structural Funds, youth employment and green growth, all areas where regions and cities must have their say. The EU must show it can deliver results and with potentially EUR 300 billion to be invested in cities and regions in the coming years, regional and cohesion policy will play a decisive role". Dnevnik, EURACTIV partner in Bulgaria: ?????????????? ???????? ??????? ?? ?????? ?????????? ??????? EURACTIV Turkey: Yeni Avrupa Komisyonu, AP'den onay ald? EURACTIV Greece: ??????? ???????????? ???? Juncker ?????? ??? ???????? ????????? ?